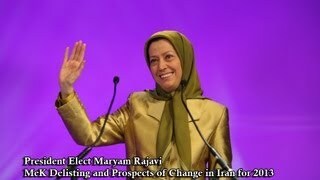 Convention for Democracy in Iran, Paris, June 22, 2013 - Thank you very much. Thank you. Madame Rajavi and other distinguished guests, of which I am very honored to be among here today, ladies and gentlemen, and especially those friends of ours that are watching today from Camp Ashraf and Camp Liberty, salâm. Convention for Democracy in Iran, Paris, June 22, 2013 - Well, good afternoon everyone. It is a pleasure to be back here with you for the second year in a row. Convention for Democracy in Iran, Paris, June 22, 2013 - Thank you very much. Many of my American colleagues in particular have spoken eloquently about the many injustices, the lack of protection at Liberty and Ashraf, Kobler and Maliki's deception and duplicity, and the tragic and unnecessary loss of life. Convention for Democracy in Iran, Paris, June 22, 2013 - Good evening everyone. 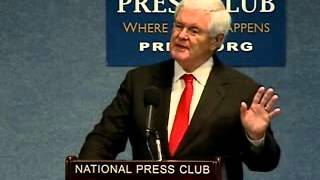 I want to begin by echoing what Newt Gingrich said, all of you by being here tonight are making a strong, strong statement. 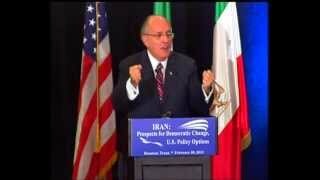 Convention for Democracy in Iran, Paris, June 22, 2013 - Thank you very much. You know, the recent presidential election in Iran, do you think it was a legitimate election?